Robert Murray Stamp Shop is Scotland's best-stocked and most popular shop for stamp collectors, with hundreds of thousands of items of stock always available. Independent, hard-working, and interested, we hope we can help you. Our shop was established in 1977, and has been operating at the same address and under the same ownership and management continuously since then. There are many pages to our site, and it may take you a while to find your way around - our links and our Contents Page should help you out. But please remember that what is listed on our website is only a very small section of what you can find in our shop. Some of our most popular mail order lines are shown and described on one page for your convenience. If you want some information about our Stamp Shop we hope the information here is helpful, but we are willing to answer any other questions you may have. As Stamp Dealers we buy and sell stamps, collections, covers, and so on, as well as dealing in postcards, cigarette cards, coins, medals, and banknotes, and all types of collectors' supplies. We run regular public auctions, and carry out valuations for all purposes. You can see our latest Auction Catalogue - we have a new one every few weeks. Many of the products we deal in are available to buy through this website - please explore ! Basic information about our shop (location, opening times, stocks, and so on). United Kingdom Commemoratives price list . Background to our auctions . Details of our services as valuers . Information about stamp and postcard clubs in the Edinburgh area. Details of how to order from us. Buy stamps online ! A list of some of our own favourite hyperlinks . Our policies on returns, complaints, privacy, security, etc. Due to our attendance at Scottish Philatelic Congress, our shop will be closed on that Saturday. Our next public auction sale is on Monday 3 June 2019, and the catalogue will be available on this website a week or so before the sale date. See this page for general auction information. Our auctions are held every few weeks. Auction dates in the first part of 2019 are 11 February, 25 March, and 3 June. We have been getting such a large number of phone calls about modern UK coins - particularly the 50p, but also £1 and £2 - that we have written new web pages explaining the actual values of them; see fifty pence, one pound, or two pound pages. We do not need to buy any of these ! 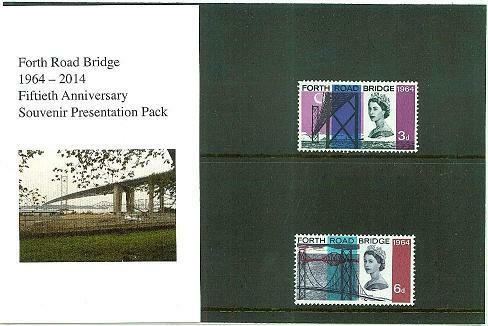 We've produced a special pack for the Bridge's Fiftieth Birthday, using original 1964 stamps, the black card and clear cover from 1970s/80s packs, but with a completely new descriptive wrapper, using photographs taken on the actual anniversary day (4 September 2014). These are available in our shop at £5 each. The Shop has an online presence on Facebook, Google+, and at LinkedIn. Please feel free to "like" or "connect" as appropriate in order to keep up with some of the snippets and comments that might not appear here. We can provide gift vouchers for any value £5 upwards, and which can be spent on any purchases from our shop. We're even happy for people to spend their voucher in stages. These can be supplied by post. We made a policy decision to stop handling new UK stamp issues as a matter of course. (We do however continue to handle them on the secondary market.) For further information please follow this link.Also see Robert Murray's major article (published in The Philatelic Exporter) on the subject of the British Post Office's stamp issuing policy, and how this might effect the stamp business. Follow this link. Other quick links; Are you new to Edinburgh ? Thinking of making a visit ? Edinburgh is a marvellous city, and you can get yourself a quick introduction to it by watching this short video produced by Edinburgh University. REMEMBER TO BOOKMARK THIS SITE IF YOU LIKE IT ! 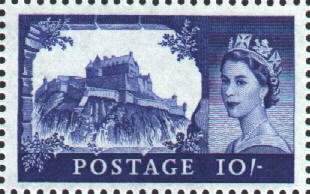 There are pages on this site with information about Great Britain Stamps, Robert Murray's Philatelic Bureau, Isle of Man stamps, Jersey stamps, kiloware,stamp albums and accessories, philatelic literature and stamp catalogues, modern sets of Aland Islands, Faroe Islands, Greenland,Iceland, and Norway. Within the United Kingdom listings are sections for Scottish Airletters, non-commemorative presentation packs,year books, year sets,pictorial booklets, and ofprestige booklets. The supplies page will give information about the products of Stanley Gibbons, Hagner, Prinz, Hawid, Showgard, Davo, Lighthouse, Compass, Cosmic, Royal Mail, Barrington, Prangnell, Rapkin, Godden, Benham, and Safe, as well as general information about watermark detectors and ultra-violet lamps. Beatles Stamps.Robert Burns stamps. Stamp albums for children, and starter packs. Modern coin values. Pages are here about our stamp auctions, our stamp shop itself, valuation service, direction maps, stamps for charity, coin shop banknotes and medals, Edinburgh Walking Tours and Edinburgh Running Tours, and much more. Explore the site - or see our general CONTENTS PAGE. This website and its content is copyright of Robert Murray - © Robert Murray 2019 (and earlier years). All rights reserved. This applies to all websites under our administration.